Surgeons treating brain cancer face a conundrum: They can capture ultra-high-resolution images of the tumor using magnetic resonance imaging (MRI) or they can use ultra-precise surgical tools to remove the tumor, but they can’t do both at the same time. At least they couldn’t previously. Today, Worcester Polytechnic Institute professor Greg Fischer, is busy developing a surgical robot designed for use inside an MRI machine (see figure 1). Guided by real-time feedback, the robot can position a high-energy, interstitial focused ultrasound probe exactly at the tumor, delivering optimal surgical results and an ideal outcome for the patient. Of course, building a robot that can operate within the high magnetic fields generated by an MRI unit was not easy, but with sophisticated controls engineering and piezoelectric positioners from MICROMO, the WPI team has built a system that promises to revolutionize the treatment possibilities of MRI. Challenge: Design a surgical robot designed for use inside an MRI machine that can operate within the high magnetic fields generated by an MRI. Solution: Use sophisticated controls, engineering and piezoelectric positioners from MICROMO. Results: WPI team has built a system that promises to revolutionize the treatment possibilities of MRI. The process of designing surgical devices is rife with challenges. Systems need to be accurate and repeatable, with ultrahigh resolution. They have to be electrically quiet. Above all, they must be reliable. In the case of the MRI robot, Fischer’s team faced another enormous challenge delivering all of these characteristics in a system that can also function in multi-tesla magnetic fields. The powerful magnetic field generated by an MRI machine makes hazards of even small ferromagnetic objects like screws, let alone, motion devices like permanent magnet motors, gearboxes, and actuators. It was obvious from the outset that the MRI robot had to be based on non-traditional actuation. The answer proved to be a piezoelectric device. Piezoelectric actuators are based on a piezoelectric ceramic that expands under an applied voltage. 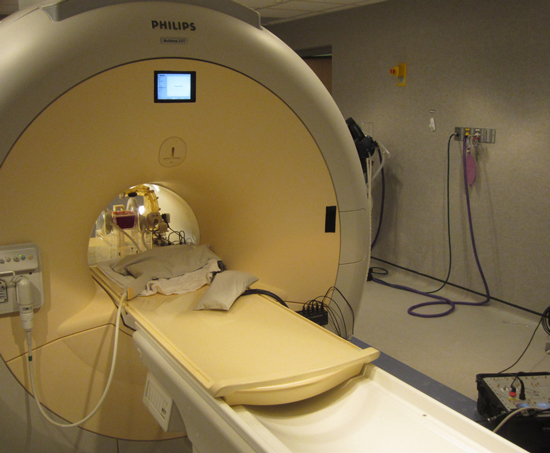 The problem is that the displacement introduced by the piezo effect is only a fraction of a percent of component size, while the MRI robot required up to about 100 mm of linear travel or a continuous 360 degree rotation. The WPI team found the solution in the PiezoLEGS motors from MICROMO. The units consist of a set of bimorphic drive legs that are constructed so that under an applied voltage, they flex slightly and extend (see figure 2). 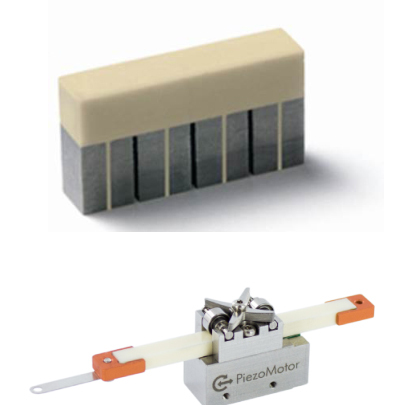 Figure 2: PiezoLEGS® motor (bottom) consists of bimorphic piezo ceramic legs (top) that respond unequally to an applied voltage. In practice, they are driven in alternating pairs (see figure 3) so that they “walk” a drive rod forward in nanometer steps at speeds as high as 15 mm/s (or spin a disc in the case of rotary motion). Because one set of legs is the always in contact with the actuator at any time, they are inherently safe actuators (providing braking when unpowered) with the motors provide a stall force (holding force?) of up to 10 N.
The WPI robot consists of one module with X, Y, Z translation and two rotational modules that correspond to the arc angles of a head frame. Future designs will include additional of degrees of freedom to permit the insertion and rotation of cannula and stylet. To generate linear motion, the WPI team uses a combination of linear PiezoLEGS® motors in a direct drive for needle insertion and rotary PiezoLEGS® motors to drive aluminum lead screws. For rotary motion, they use 3-D-printed custom pulleys and rubber- or fiberglass-reinforced timing belts. Figure 3: A voltage applied to the biomorphic legs causes them to bend and extend or retract, allowing them to move a drive rod forward. • Piezo LEGS® Linear 6N which moves a 100.8-mm drive rod over of 80 mm at speeds as high as 15 mm/s. It delivers micro-steps as long as 4 µm with nano-scale resolution. • Piezo LEGS® Rotary 50 mNm, which provides positioning over 360° at micro-radium resolutions.